Adley’s lecture and performance will highlight timely political themes in the Middle East and beyond, such as inter-religious dialogue, migration, geopolitical shifts and the power of cultural awareness. 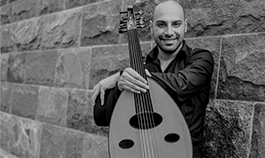 Below, Aldy took some time to answer questions about the oud, his background and career. CAN YOU PROVIDE SOME HISTORY OF THE OUD? The oud is often referred to as the first stringed instrument in history. According to some historians, it first appeared in 3000 BCE and was played during the time of King David. From the Holy Land, it reputedly came to the Egyptians and the Iraqis, following the wanderings of the Israelites. THE OUD IS CALLED “THE KING OF ARABIC OF INSTRUMENTS,” WHY? The oud was first played in Egypt and Iraq and then quickly spread around the Arab world that surrounds the Gulf, specifically Kuwait and Saudi Arabia. Its sounds are well known all over that region and is just as common as the guitar is in the United States. The oud tends to reach to the heart of the audience. They used to play it in the temples in ancient Egypt, which encouraged people to come and worship. 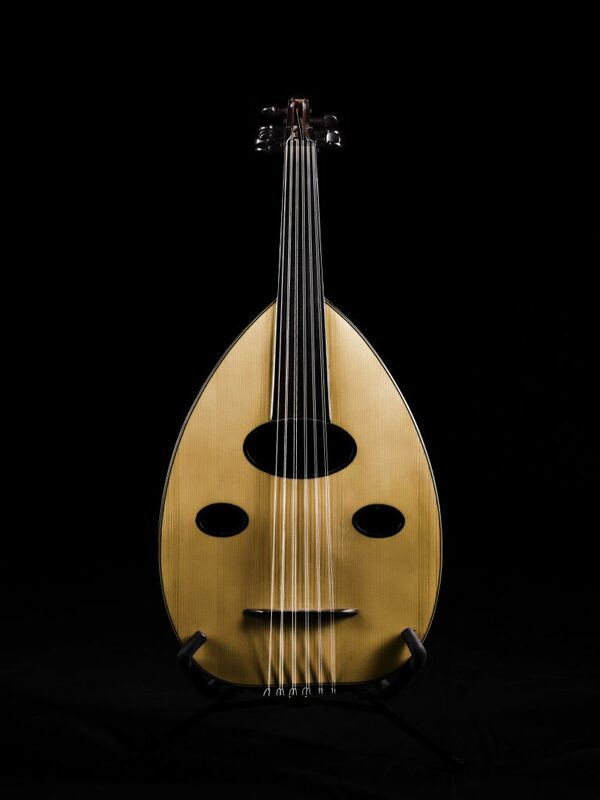 WHAT INSPIRED YOU TO BEGIN PLAYING THE OUD? The oud was always a part of our home in Assiut, Egypt. I grew up watching my grandfather, brother, sister and uncle all play the oud. My grandfather taught me to play when he was 92 years old. He had old, wrinkly hands and was teaching me how to play. As soon as I picked it up, it was all I could think about and I haven’t been able to put it down since. WHAT LED YOU TO PLAY CONTEMPORARY MUSIC ON THE OUD? I love to play both old and new sounds and techniques on the oud. Just imagine finding yourself on a trip to India, for example. Let’s say you’re a jazz musician and on this trip you hear different scales, rhythms and moods. You are inspired and find a way to combine your sound with what you’ve just heard and you end up creating a new genre of music. My travels to Europe and here in America have inspired me to compose the music I play today. HOW DOES THE OUD HELP YOU DISCUSS/INTRODUCE TIMELY ISSUES ABOUT THE MIDDLE EAST WITH YOUR AUDIENCE? The Middle East is an ancient land where you’ll find Jews, Christians and Muslims. Regardless of the turmoil happening in the region, music has no limits or bounds and can bring people together. The music I will play during my concert will be an introduction for many who have never heard the oud or its sound. It opens doors and conversations from all backgrounds. The notes, rhythms and sounds I play might sound a bit foreign but in addition to my own compositions, I will play a couple of familiar cover songs but with a Middle Eastern twist. WHAT CAN PEOPLE EXPECT AT YOUR CONCERT AND LECTURE ON JUNE 19? Music that will take all of us to an open world of inspiration. The audience and their souls will inspire me to build special moments throughout the concert. My program often changes while I’m playing based on the feelings and moods and my hope is that we will travel together through the strings. My wife is a University of Utah alumna and from the area. I am in love with Utah, its people, culture and scenery. I am impressed by the education and culture found here, not to mention the beautiful mountains, rivers and lakes. I am also impressed with the clean-cut community and as an artist have been deeply moved by the kindness and acceptance of others. Nathan Devir [director of the Middle East Center] has made me feel so welcome and I am honored and grateful to be a guest of this great community. which sticks in their minds for a long time. Before we delve further into the topic, let’s first understand what “music” means. combination of sounds taken from the spirits, something very special. outside world. An idea yearning to be heard. Sounds good, doesn’t it? “earworm” tune in your mind that came out of your creativity. may be delighted with the results. it a complete real estate unit. Interesting, right? will enhance the listenability of your song. devices on which your song will be played. What is the Oud instrument ? The history of the Oud spans millennia, making any brief statement feel inadequate. Yet the basics about the instrument hint at its long influence on music in one of the cradles of human civilization. following the wanderings of the Israelites. Though the instrument has changed over the eons, it still retains many of the same features, especially its haunting, stirring sound, suggesting ancient times yet remaining a vital source of inspiration for musicians around the world. form of the Oud. Oud is known as the first stringed instrument in history. The oldest pictorial record of the Oud dates back to the Uruk period in Southern Mesopotamia (Iraq), over 5000 years ago on a cylinder seal acquired by Dr. Dominique Collon and the seal is currently housed at the British Museum..
introduces light and shade into the execution. Munir Bashir (Iraq) extended the technique by using the right hand too; he has made it one of the canons of present-day aesthetics of the’ud. impact of the plectrum; the outstanding proponents of this style are Abdullahi Qarshe and ‘Umar Dhule. chair with a straight backrest. a stretch without using the foot stool to keep your back posture straight. not placed that way, you will lose balance while playing on the Oud. How to hold the neck of the Oud? should hold the fingerboard in the following way. How to hold the pic of the Oud? Hold the Resha as seen in the picture. to look at themselves in the mirror while they practice. also boosts your confidence by helping to overcome stage fright. • The Strings Base: This is the first part on the left side of the Oud model shown in this picture. transmission to the sound box. care when designing the face of the Oud. monochromatic range of sounds on an open frequency without any limitation. How to tune the Oud instrument? E – A – D – G – C – F.
F – C – D – G – C – F.
Ramy Adly 2018 &COPY; . All Right Reserved.